During May Major John Morton Clayton (right) took over Command of the 6th Battalion from Lieut.-Colonel Geoffrey Meinertzhagen Jackson (left). Colonel Jackson had been gazetted 2nd Lieutenant in the 2VB the Sherwood Foresters on 11th April 1891 and had been allowed an extended term of Command. Indeed, Jackson had taken over Command of the Battalion in May 1904 from Colonel Herbert Brooke-Taylor (centre) and he was instrumental in the smooth transfer from the 2nd Volunteer Battalion to the 6th Battalion Notts and Derby Regiment under the “Territorial and Reserve Forces Act of 1907”. 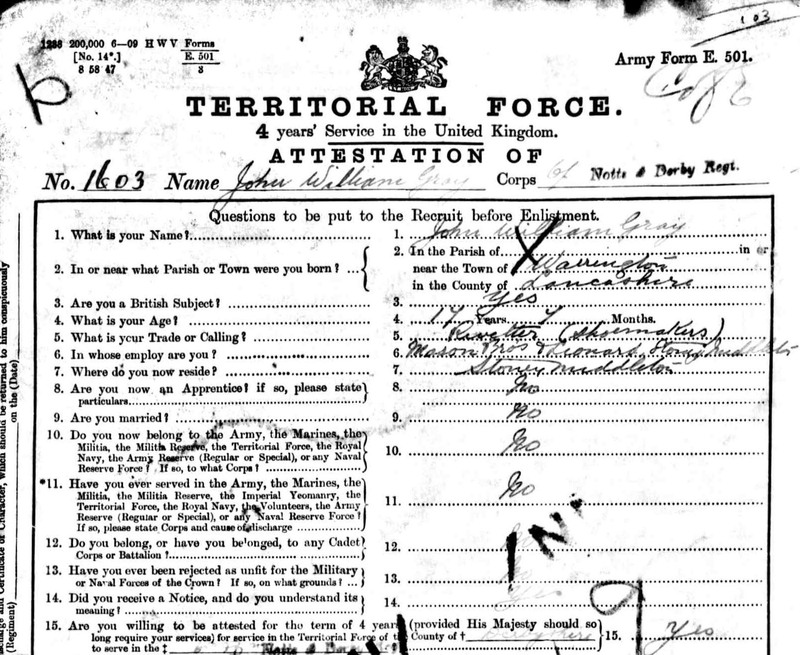 The Regimental Annual records that musketry training was difficult to organise, but during the year several local ‘miniature ranges’ were improved and many of the men were able to qualify under either the standard test or under TF regulations, whilst seven men qualified as marksmen following successful completion of Part III of the Regular Soldier’s Course. It is interesting to record that 166 Colour-Sergeant William Barker of “D” Company was 16th in the Queen Mary’s Competition at Bisley with 141 points. During the later part of the year an Inter-Company Competition was held at Edale for the Battalion Challenge Shield. 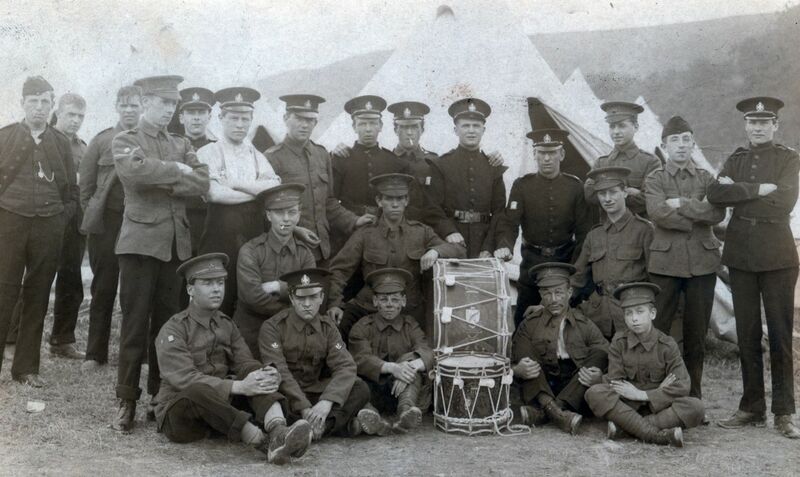 In August the Battalion attended its annual training camp in the neighbourhood of Aberystwyth. 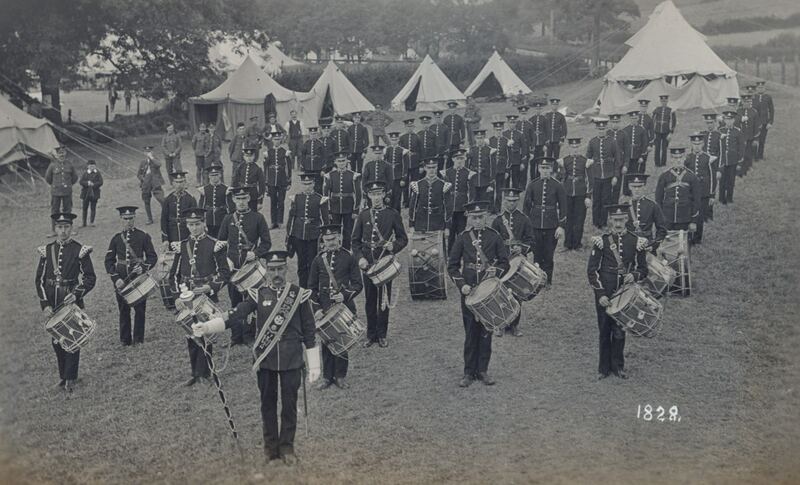 This was a North Midland (NM) Division camp under the command of Major-General Hubert Hamilton, C.B., D.S.O., (1861-1914) and all the units of the Division were present with the exception of the Northamptonshire Yeomanry and the 2nd and 4th Brigades of Artillery. 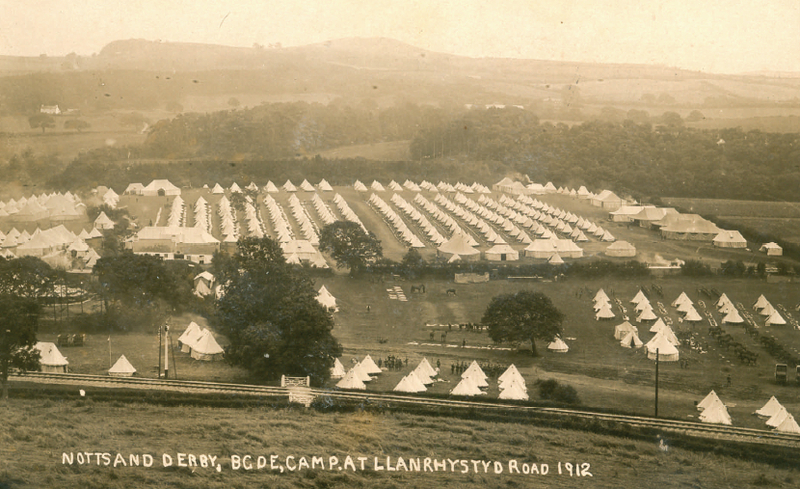 1) The Notts & Derby Brigade were camped at Llanfarian with the 2nd NM A.S.C. and the 1st NM Field Ambulance all under the Command of Colonel C.T. Shipley. 2) North Midland Divisional Headquarters and the Lincoln and Leicestershire Brigade were camped at Lovesgrove with the 1st NM Brigade R.A., A.S.C. 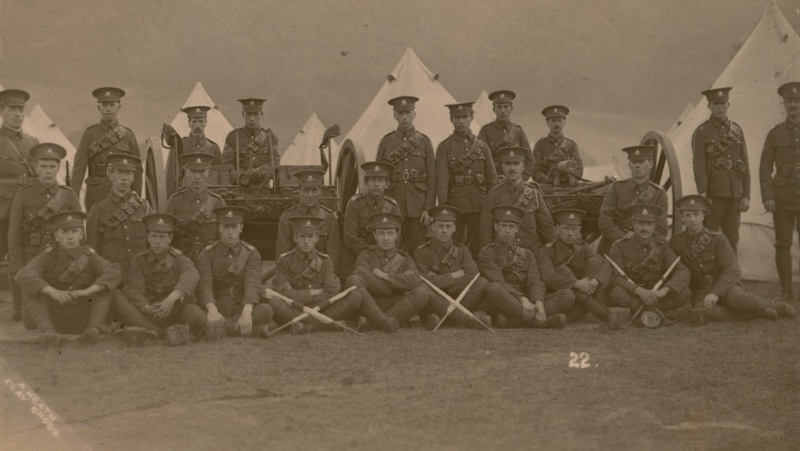 and the 2nd NM Field Ambulance all under the command of Colonel Carthew-Yorstoun. 3) At Bow Street were the Staffordshire Brigade with the 3rd NM Brigade R.A., A.S.C. and the 3rd NM Field Ambulance all under the command of Colonel A. J. Chapman. 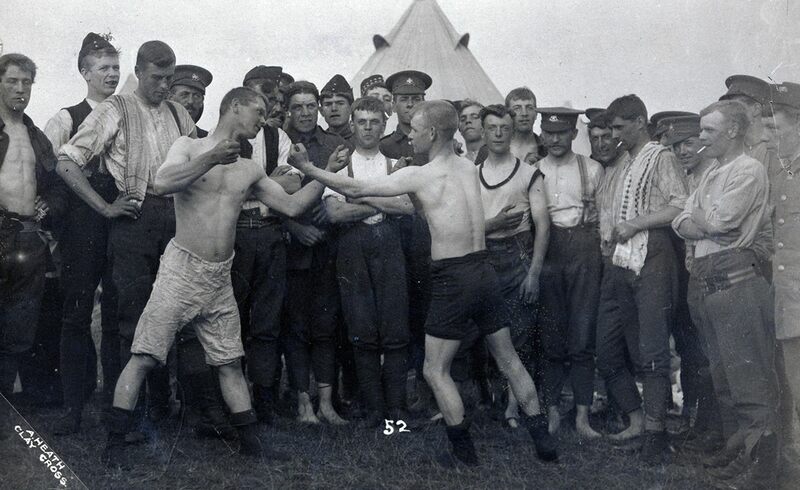 During the Camp the men of the Notts & Derby Brigade undertook training on the moor above the Camp, which was varied in its topography and therefore suitable for a variety of different training activities. At least three different photographers visited the Camp to record the events and included Hans Peter Hansen (Ashbourne), Albert Heath (Clay Cross) and Hiam Lang (Cardiff). 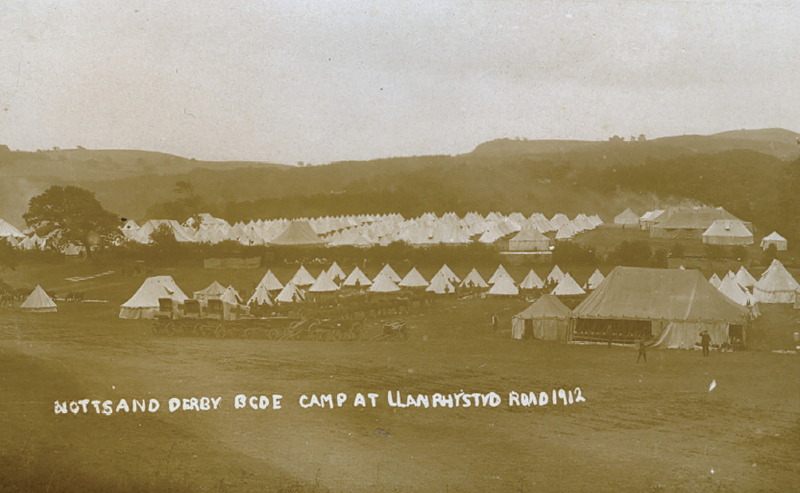 The Notts and Derby Brigade campsite at Llanfarian (unknown publisher). 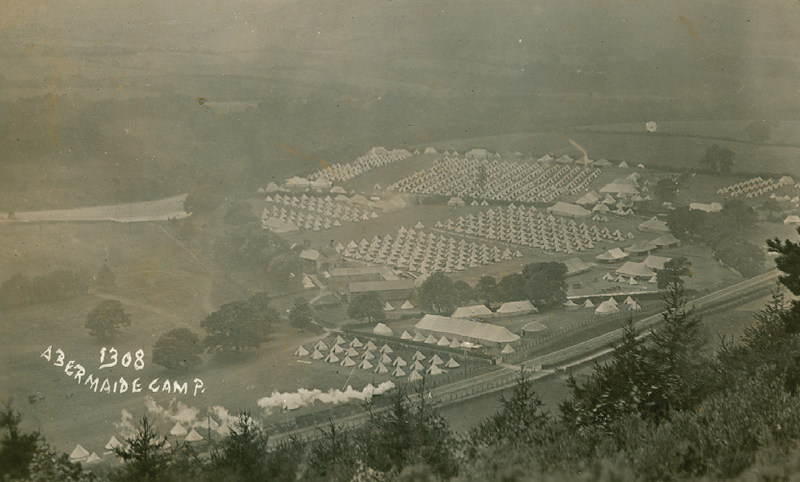 This campsite was also known as ‘Abermaide’ (by the 6th Battalion) and ‘Aberystwyth’ (by the 8th Battalion). The 7th and 8th Battalions were camped in the field closest to the farm, whilst the 5th and 6th Battalions were camped in the adjoining field. The solitary tree in the middle of the 6th Battalion camp (which is still standing today) provides a good reference point. The men’s tents are pitched in eight rows of 14 tents, with each row of 14 housing a Company of men. Visible in both pictures is a steam locomotive heading south towards Pencader where the Milford & Manchester Railway (M & MR) joined the Carmarthen & Cardigan Railway (C & CR). At this point the railway ran along a single track. 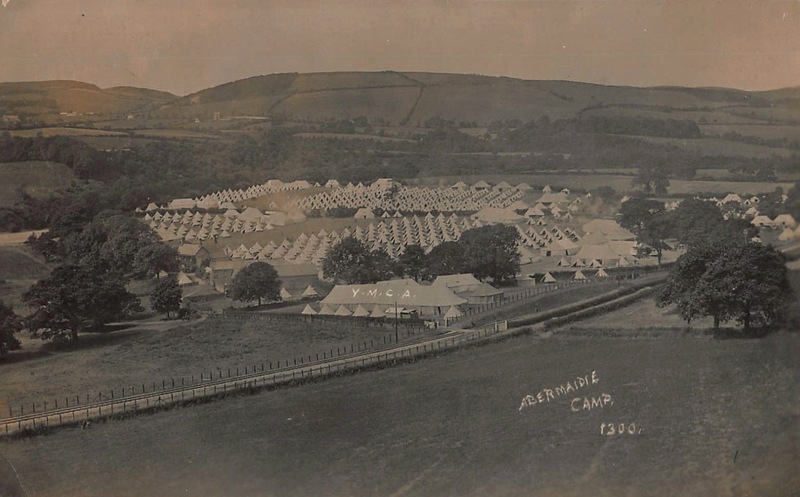 The Camping grounds around Aberystwyth were ideally suited for training large bodies of men. There was a plentiful supply of clean water and numerous roads, with little traffic, enabled efficient marching to and from the manoeuvring areas. 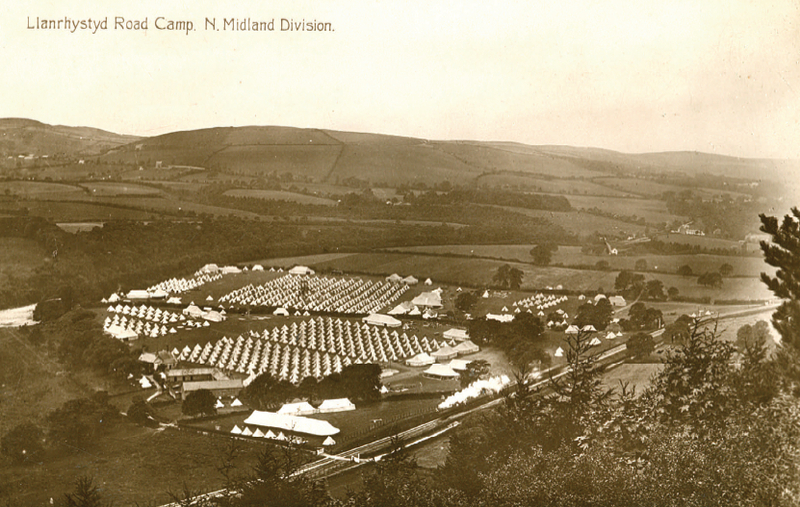 Furthermore, each Camp was served by branches of the Cambrian Railways Company and had their own sidings that allowed the Army Service Corps and Royal Engineers to prepare the ground for the arrival of the troops and to keep them adequately supplied during their two weeks at camp. 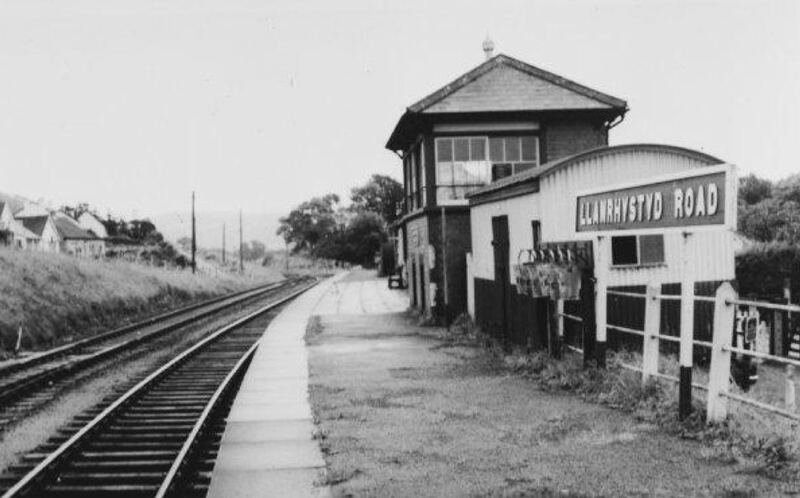 The closest station to the Camp was Llanrhystud Road station in Llanfarian (© Crown Copyright: Royal Commission on the Ancient and Historical Monuments of Wales 2006). 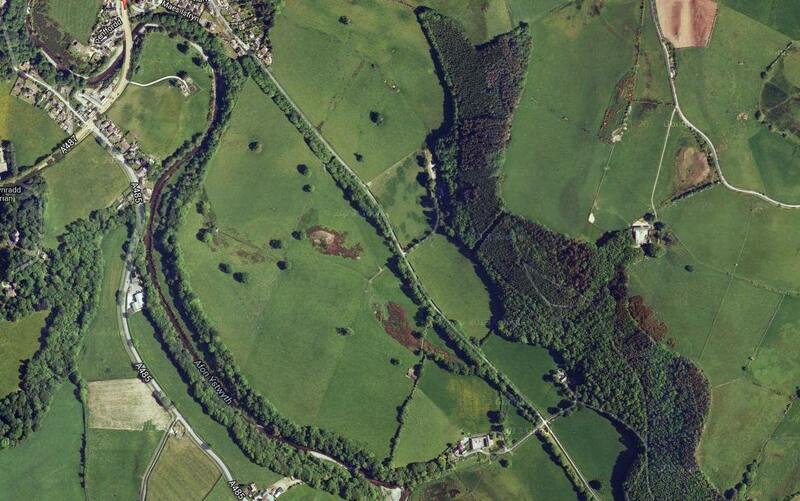 The actual campsite was located on farm land close to Aberbrwynen and was bounded to the north by the Milford & Manchester Railway (M & MR) and to the south by the River Ystwyth. 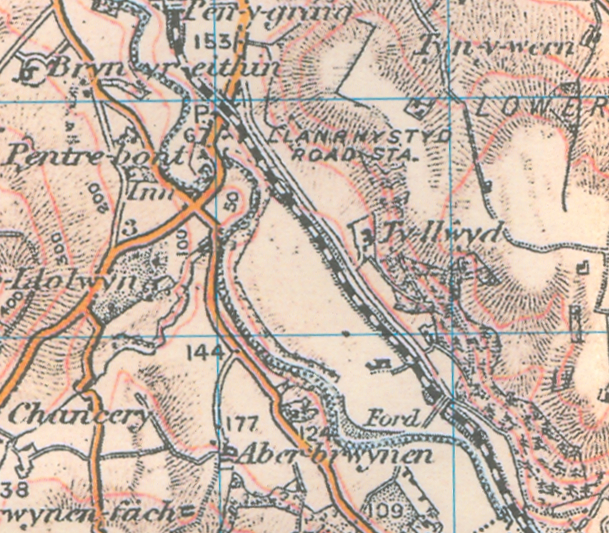 The closest station to the Camp was Llanrhystyd Road station in Llanfarian. 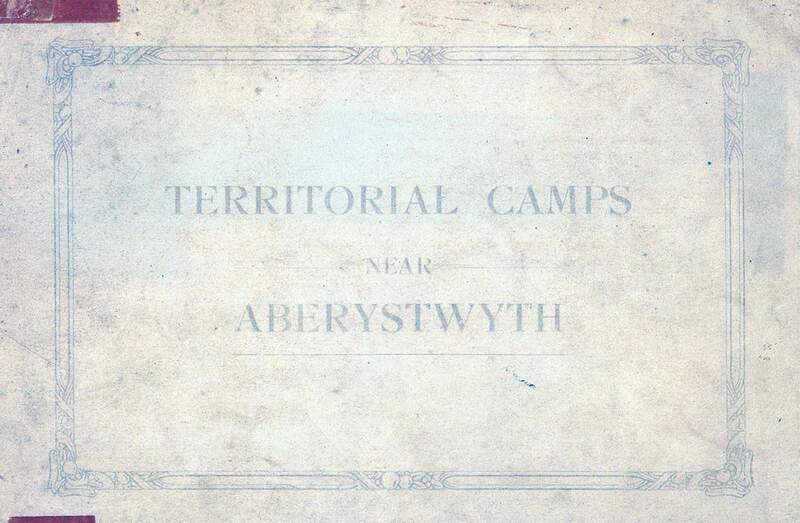 The Territorial Army Camps around Aberystwyth had their own postal service (between 1910-1914) with unique post marks and local boys were paid as messengers receiving 5 shillings a week for 48 hours work. The site of the Camp has changed little over the last 100 years, although the railway line has long been abandoned and the bridges across the river have fallen into disrepair (© Goggle 2013). 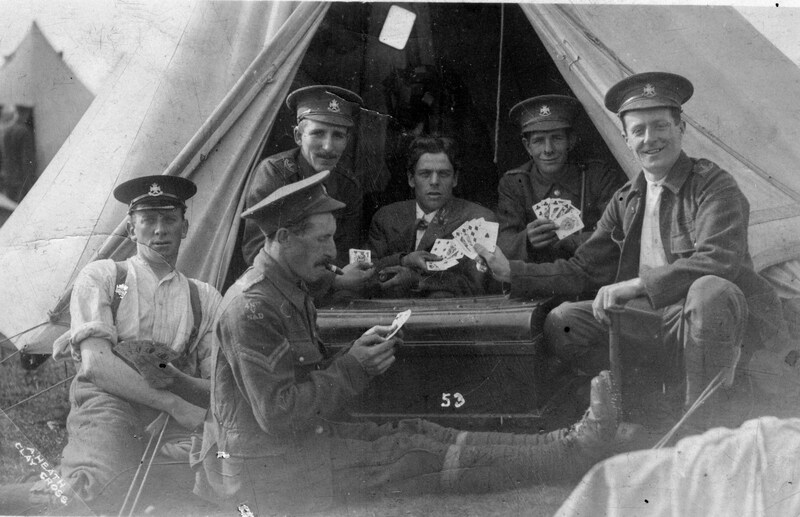 Two more photographs of the Brigade Camp and both cards are from the same unknown publisher. The latter picture shows horse ambulances of the 1st NMFA. Major Godfrey Goodman and men of the 6th Battalion arriving in Camp along the small track bordering the railway line. Also present is 1251 Sergt.-Major John Shepherd suggesting that this may be “G” (Clay Cross) Company, in which case 117 Col.-Sergt John Hoult can also be seen marching behind the Captain (HP Hansen #1612). 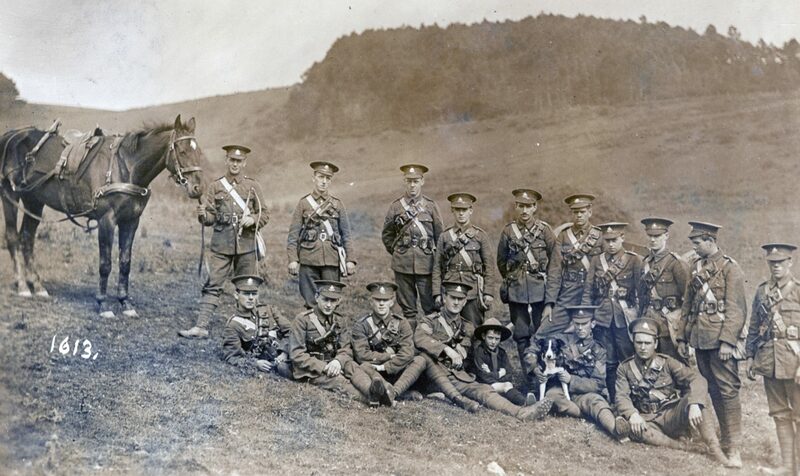 The machine gun team on the moor above Llanfarian Camp (HP Hansen #1613). This card was posted from Bakewell on the evening of August 12th, which suggests that it might show men from “D” (Bakewell, Tideswell and Stoney Middleton) Company. The card is addressed to Miss Turrall and signed “HDR”. HDR is in fact 479 Sergeant Henry Davies Rye, who was an architect by trade and lived at 47 Castle Street in Bakewell and Miss Turrall was his fiancé. 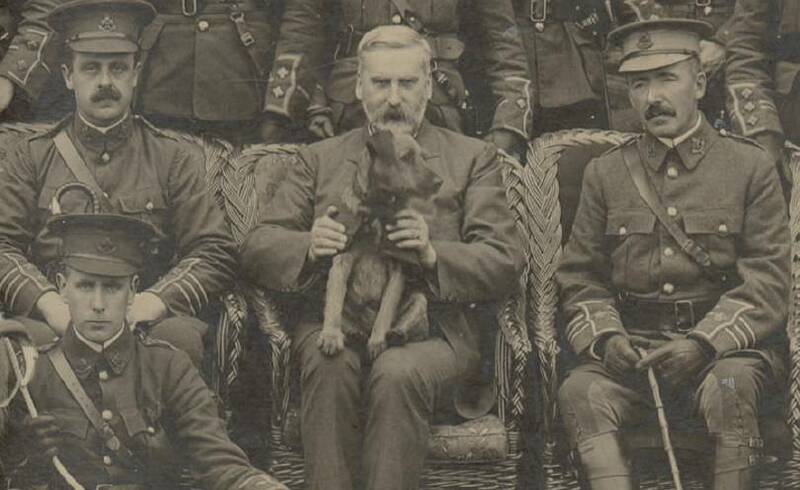 Sergeant Rye is seated holding the dog and to the left is 248 Sergeant Joseph Needham next to the small boy. Henry Davies Rye was born in May 1880 in Helmsley, Yorkshire. He enlisted in April 1908 and was awarded the TFEM in April 1913. He served with “D” Company on mobilisation, but was subsequently Commissioned into the 8th Battalion Notts and Derby Regiment as a 2nd Lieutenant on 12th November 1914. He was promoted to Temporary Lieutenant in July 1915 and Temporary Captain in October 1915. Henry was married in 1913 to his fiancé Miss Turrall. 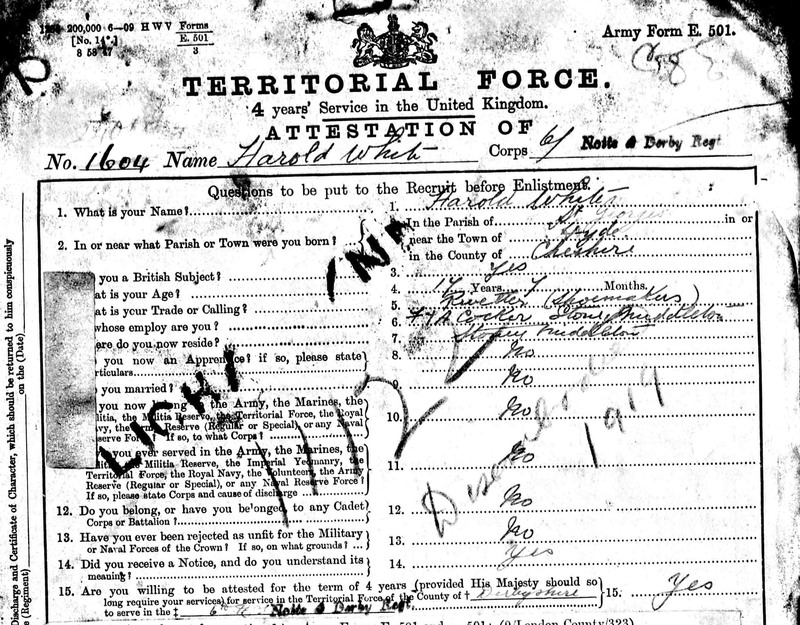 Henry’s Attestation form is a superb example of the new “Territorial Force” documentation showing his previous service with the 2VB Notts & Derby Regt and is counter signed by Herbert Clifford Brook-Taylor (WO374). 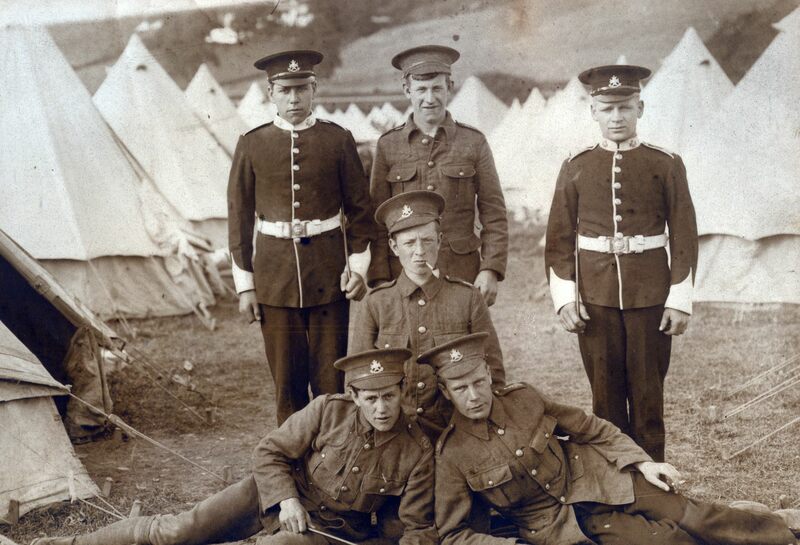 Two photographs showing men of “A” (Chesterfield) Company. 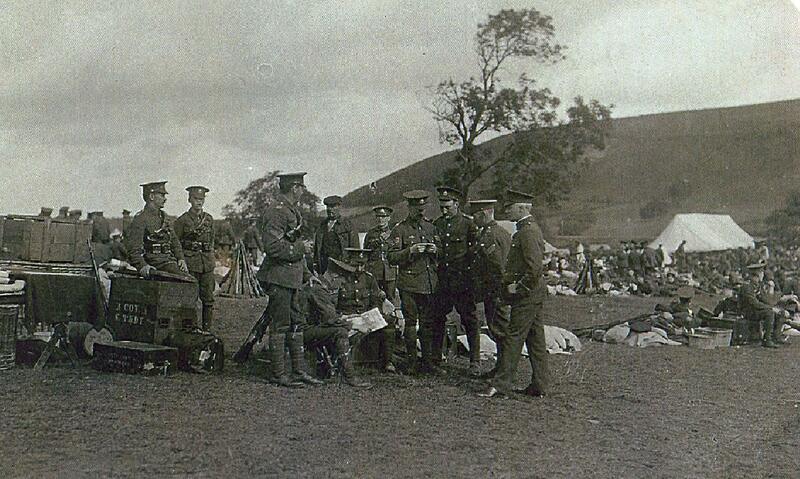 Top: NCOs and men of “A” (Chesterfield) Company preparing to pitch camp. 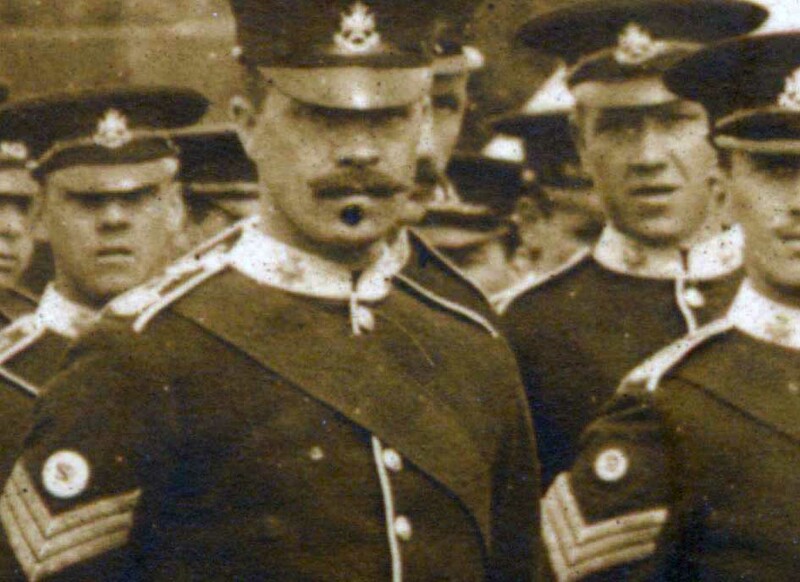 The Officer in the foreground is Lieutenant William Broomhead. Bottom: a typical inspection. The Officer in front is Maj.-General H.I.W Hamilton and he is closely followed by the recently promoted Lieut.-Colonel JM Clayton. Immediately following these two Officers are Lieutenant Victor Robinson and Major Goodman. The Officer with the swagger stick is unidentified but behind him is Captain Arthur Hopkins (O/C A Company) and Surgeon Arthur Shea is walking purposefully up the left of the column (Both photographs are courtesy of Chesterfield Library). 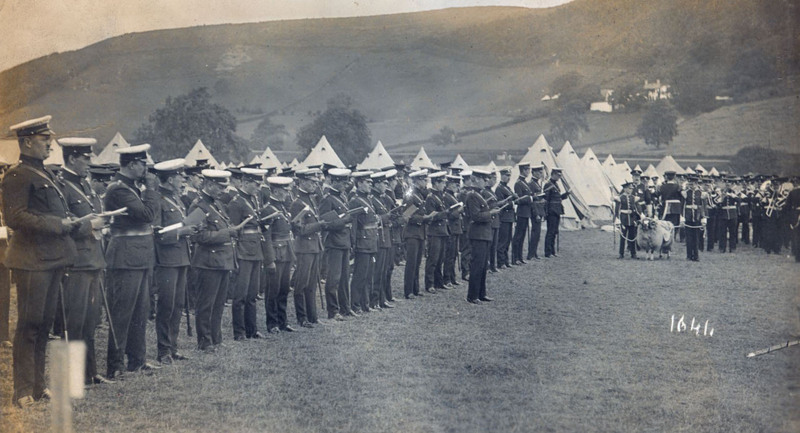 Captain Langford’s “C” (Buxton) Company at Aberystwyth Camp in August 1912 (H.P. Hansen series). 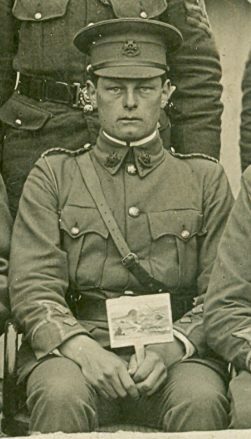 Captain Valentine Henry Elmes Langford took Command of Letter C Company during 1910. On October 12th “C” Company won an Inter-Company Competition at Edale and was awarded the Battalion Challenge Shield. Each team had to march 6 miles from Hope Railway Station to Edale and then advance up the range firing at targets when exposed. Command of “C” Company transferred to Captain Charles Edgar Heathcote in the later half of 1912 when Langford was transferred to the TF Reserve. 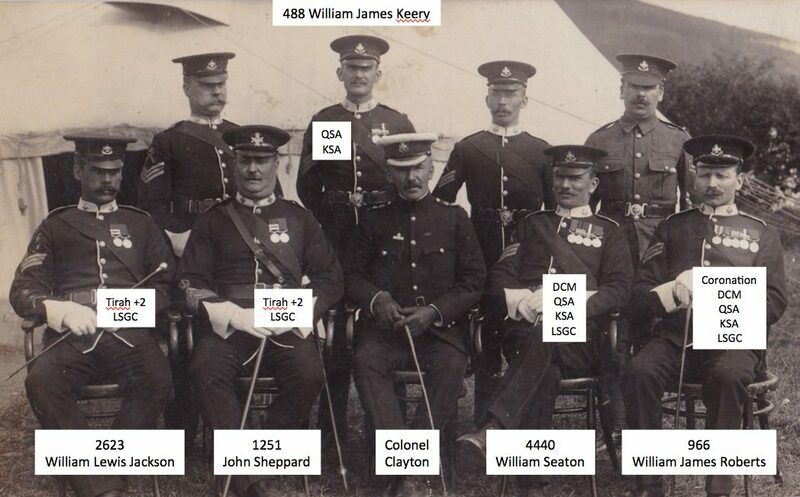 In addition to Captain Langford there are 97 NCOs and men gathered for the photograph. 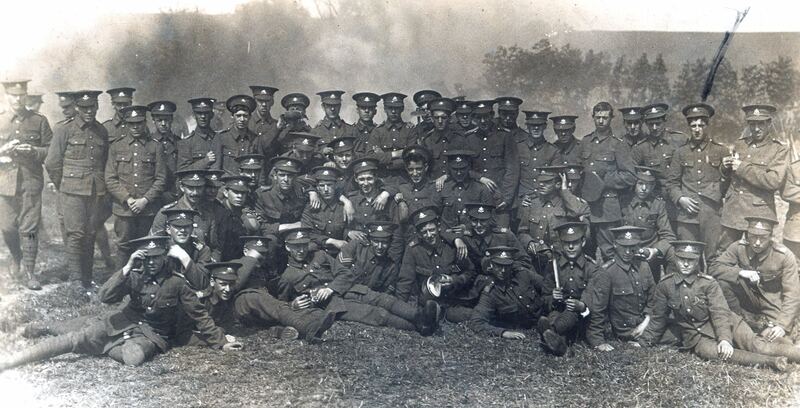 Two photographs taken by Albert Heath of Clay Cross and therefore may show men of “G” (Clay Cross) Company (# 52 & #152). 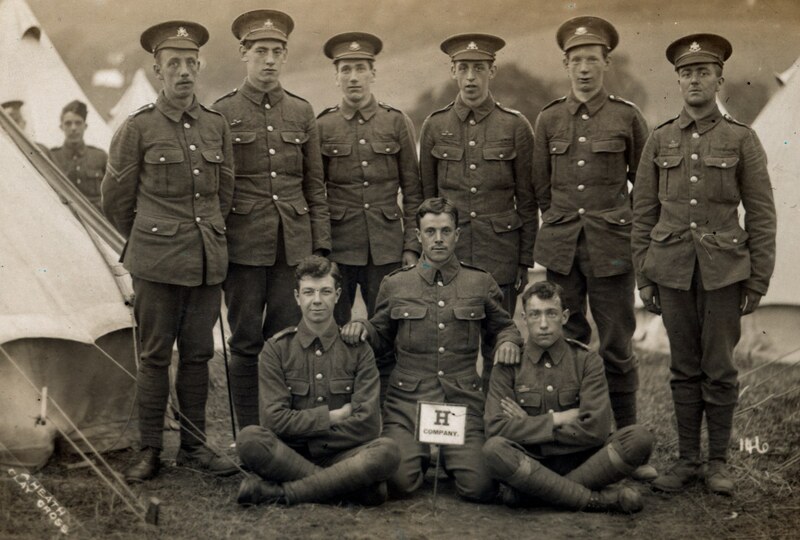 The Corporal sitting third from the right is wearing a large 1st Class Battalion Scout badge on his right arm, whilst some of the men can be seen wearing the Imperial Service Badge. 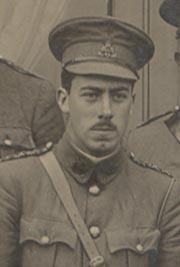 At the time of this photograph Captain Guy Nicholson was in Command of the Company. 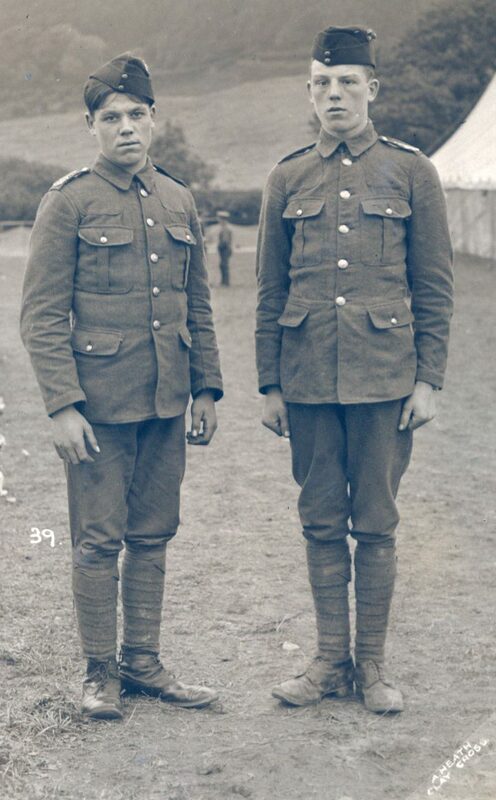 Another photograph from A Heath of Clay Cross (#39) showing two young recruits. Band of the 6th Battalion. Seated is Colonel Clayton and to his right is Newton the Bandmaster (by J.H. Waterhouse of Cavendish Street in Chesterfield). 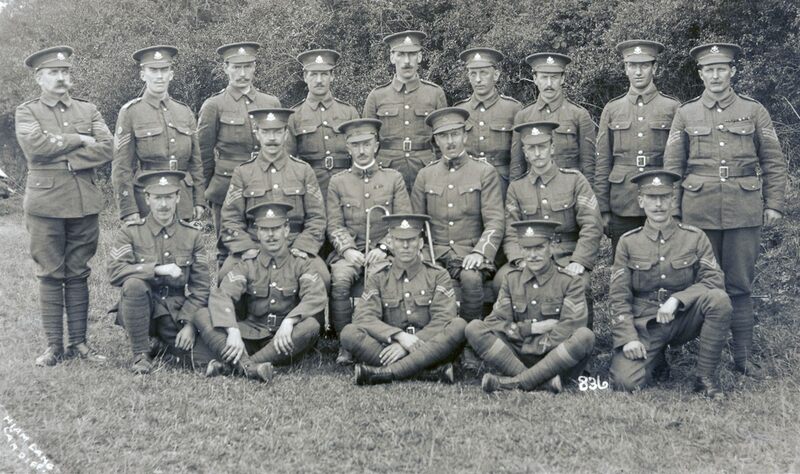 Officers and men of the 5th Battalion including 2nd Lieutenant Lewis wearing glasses (Hiam Liang #836). The officer sitting next to Lewis is John Henry Frederick Marsden, who served in the South Africa War of 1901. He was with the 1/5th Battalion in 1915 and was wounded at Little Kemmel on the 3rd June 1915. Also present at the Hohenzollern Redoubt on 14th October 1915. He was promoted to Lt.-Col. 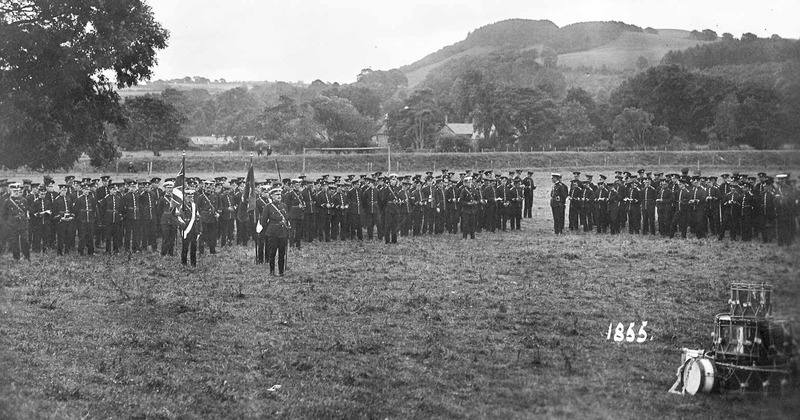 Commanding 45th Divisional Training School between 1917-18. 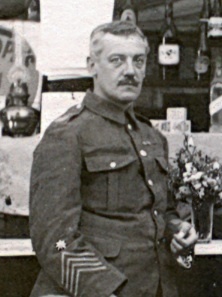 Commandant of the 46th Divisional Reception Camp in 1919 and in charge of Labour and Camps undertaking battlefield clearance in the Mons Area during February to August 1919. 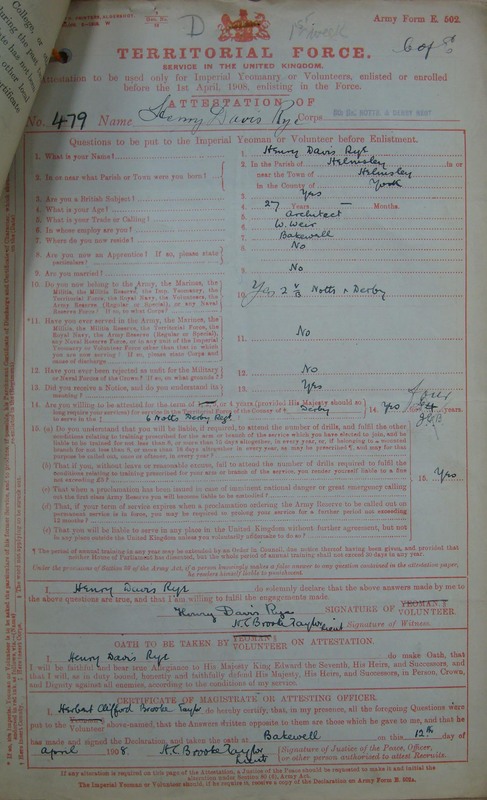 He was discharged in October 1919 (information courtesy of BRONNO). The Sergeant in the middle of the back row is 201609 Sgt. Herbert Walker. Picture taken by A Heath from Clay Cross (#22) at the 1912 Abermaide Camp and showing the Machine Gun Section of the 5th Battalion. The Officer at the back is Henry Newton. 2nd Lieut. 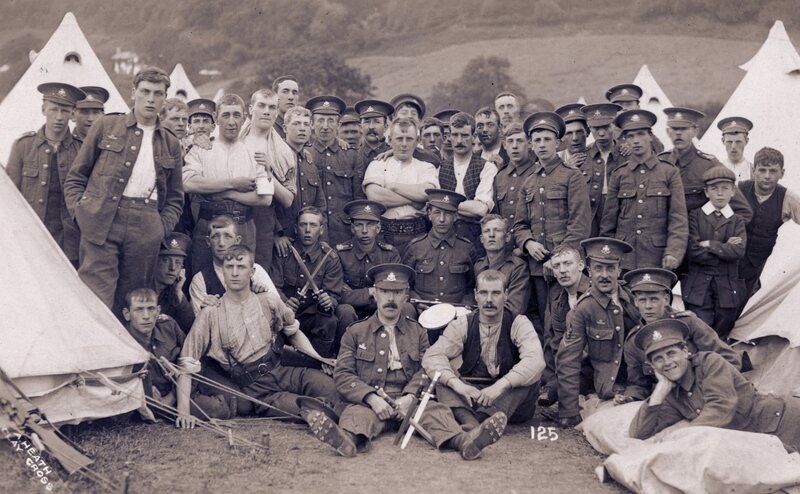 1st Volunteer Battalion The Sherwood Foresters, 28.4.1906. Lieutenant 5th Battalion, 18.9.1909 and Captain 17.11.1912. Lieut-Colonel and O.C. II Army R.E. Workshops 1915-17. 5th Battalion at a Church Parade. 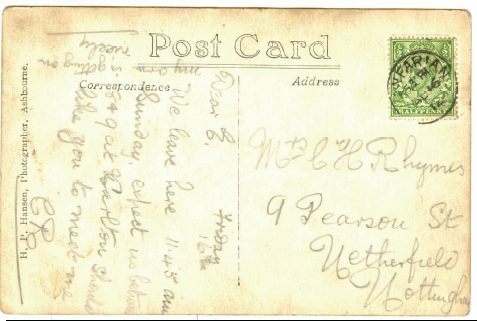 This card is part of the H P Hansen series (#1644) and was sent from Ethal Woodward to her brother Thomas Mattewson Woodward who was a railway clerk and in 1911 the family lived at 35 Gerard Street in Derby. 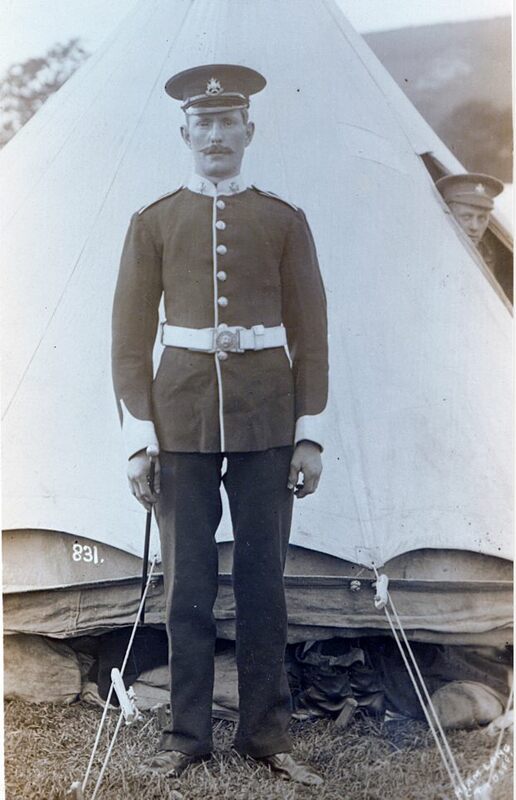 I can find no evidence that Tom served with the pre-War ~Territorials, but interestingly his father (also called Thomas Matthewson) had previously served with the Grenadier Guards (1879-91) before transferring to the permanent staff of the 1st Volunteer Battalion the Derbyshire Regiment in November 1891. 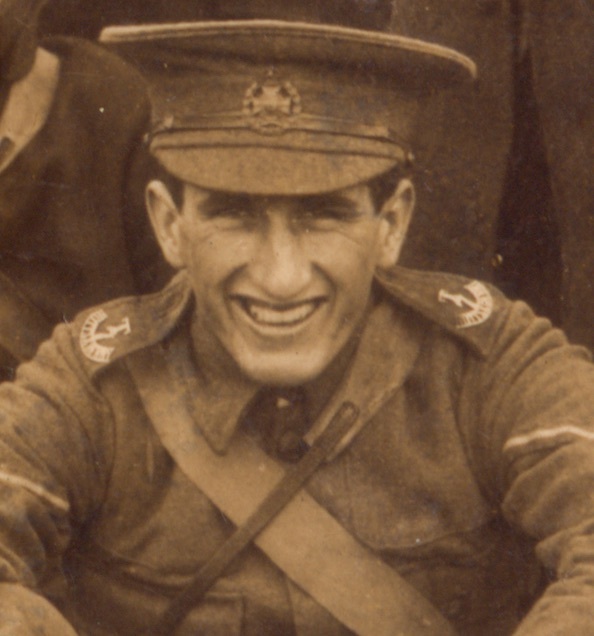 Tom Woodward (Snr) was discharged from the 1st VB Derbyshire Regiment in October 1908. Two photographs showing 1578 Pte. Percy Wildsmith (with cross over head and bottom right in lower picture), possibly of “A” Company. Both of these postcards are part of the H. P. Hansen Series. For more information on Percy please see here. “With very good wish to the Sergeants of H Co, from the Waiter”. 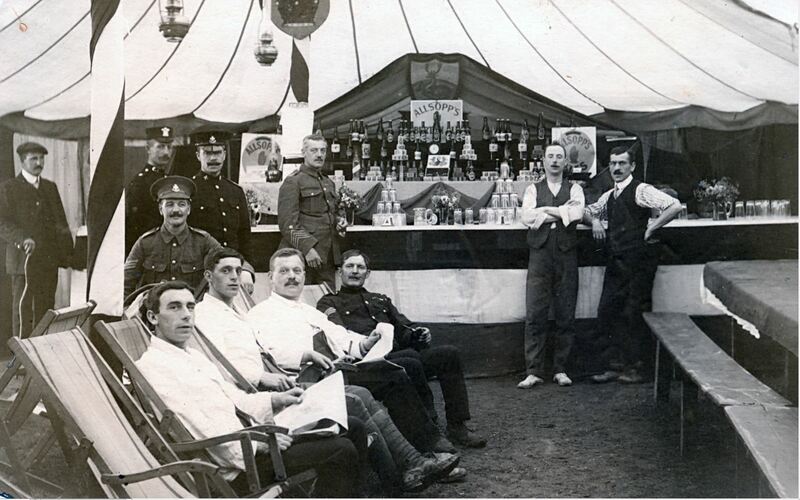 This fantastically detailed picture shows a Sergeant’s mess that is well stocked with Allsopp’s beer at the annual camp of 1912. 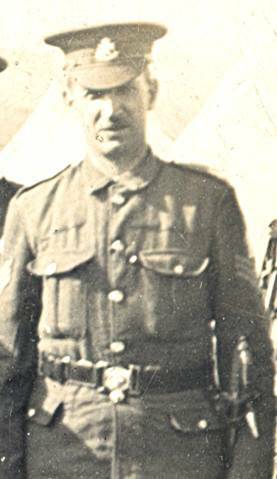 Standing at the bar is 2 Regimental Quartermaster Sergeant Harry Petrie. Also present in the picture are several other sergeants relaxing in blue patrols or mess jackets. 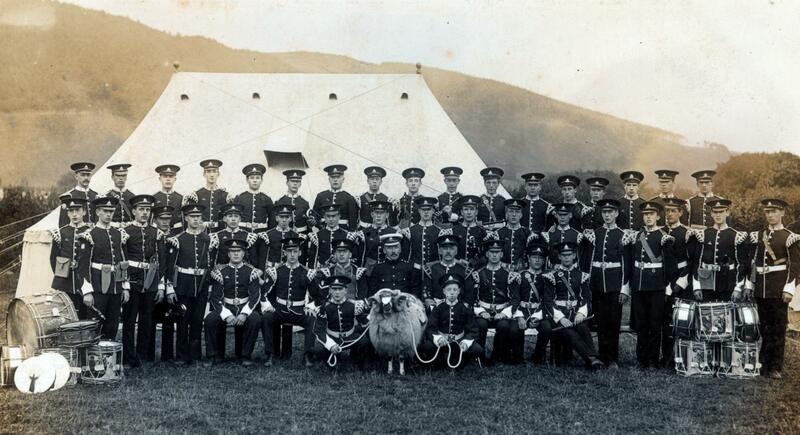 The tall man standing at the back is possibly a Police Sub Inspector of a the Cardiganshire Constabulary. 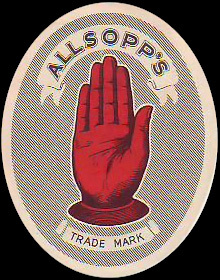 Samuel Allsopp & Sons was one of the largest brewery companies operating in Burton-upon-Trent and would have been a local brewery for Castle Gresley which was the home station for “H” (Swadlincote) Company, 5th Notts & Derby. Harry Petrie was born in Winchester in 1872 but moved to Derby where he was a sorting clerk and telegraphist. He enlisted in to the 5th Battalion on the 1st April 1908 having previously served in the 1st VB, the Sherwood Foresters from 1890. He arrived in France on the 1st March 1915 and was discharged time expired in April 1916, aged 44. 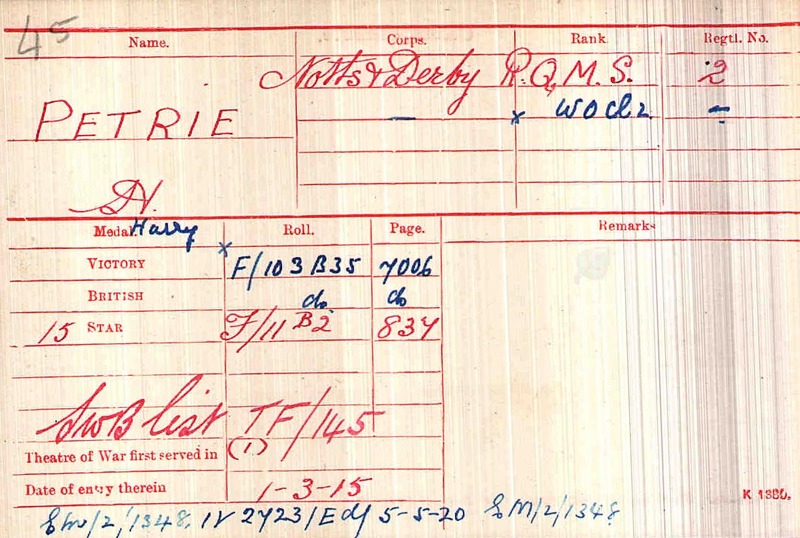 Medal Index Card for 2 Harry Petrie showing that he was entitled to the 14-15 Star, British War and Victory Medal and Silver War badge. He was later Commissioned as a Warrant Officer Class 2 (WO372). 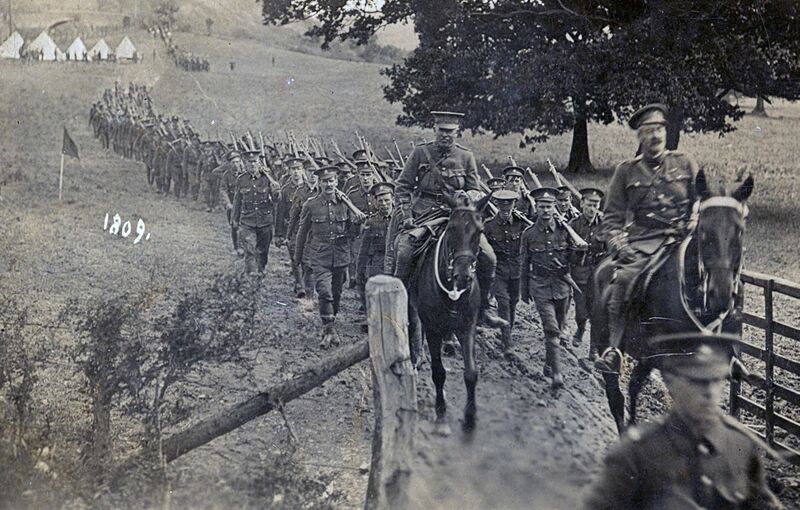 The column of men are being led on horseback by Lt.-Colonel George Saville Foljambe and Major Thomas William Huskinson. 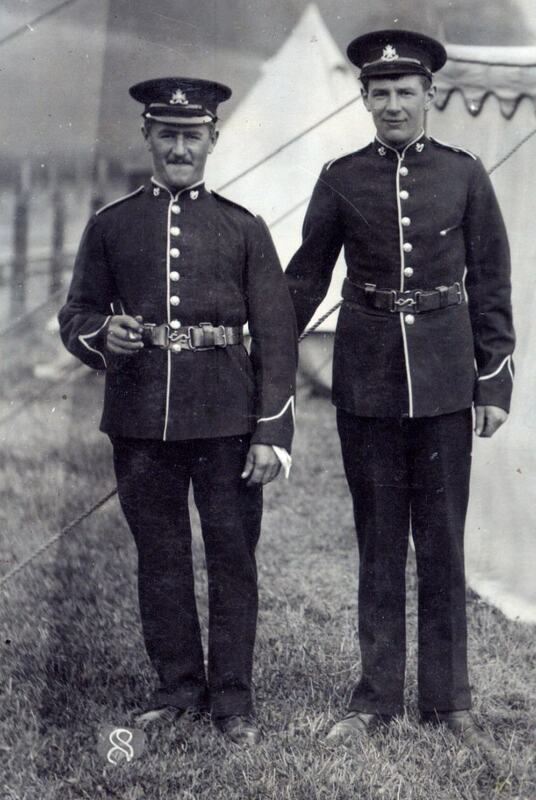 461 Sergeant Charles Rhymes is clearly visible between these two officers. The men are walking down from the brick railway bridge and passing through the gate leading to the camp. The effects of the unseasonal rain on the muddy track can be seen and this heavy rain would have hampered many of the training exercise planned for the Camp. Charles and Thomas Huskinson both served in the 4th VB and 8th Battalion and lived at the Manour House in Epperstone (Mel Siddons). The Cup was presented by the Brigade Commander to the winning section in the Sherwood Foresters Brigade competition on a 30-yards range. In 1912 this was won by a section of E Company who narrowly beat a section of Captain A. N. Lee’s Company in the 7th Battalion. 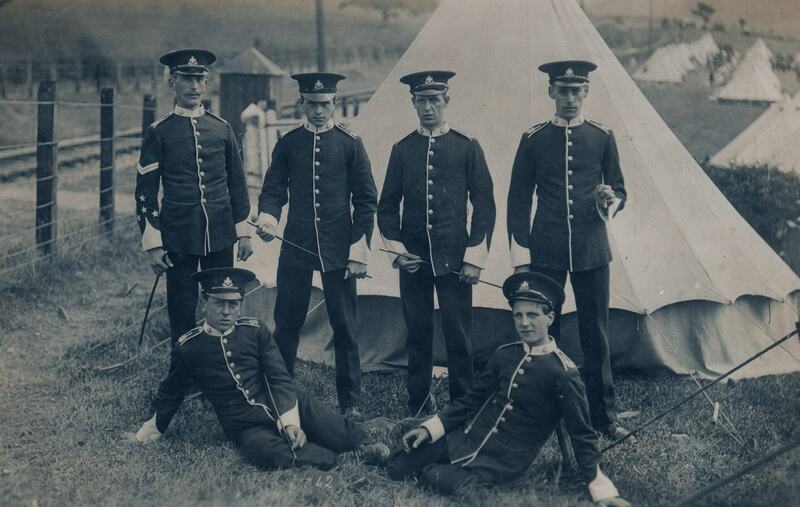 Front row from left: 412 Sergeant Charles Rhymes, Lt.-Col. George Saville Foljambe, 2nd Lieutenant Francis George Cursham, Captain & Adjutant Hugh Bliss Tarriant Humes and 2nd Lieutenant Gerald Clarke. Standing in the middle of the back row is RSM Westerman. 412 Charles Rhymes was born in Nottingham in April 1885. He originally enlisted into the 4th Notts VB on the 10th November 1903 in Radcliffe-on-Trent and was posted to “E” Company. He re-enlisted into the newly established 8th Battalion Notts & Derby Regiment on 5th April 1908 and remained with “E” Company. At this time he was living at 54 Deabill Street in Netherfield and worked for the Great Northern Railway as a servant. He married Eliza in 1905 and in total they had four children; Charles (b. 19.12.05), Dorothy (b. 19.9.07), George (b. 6.5.10) and Dallas (b. 29.1.15). 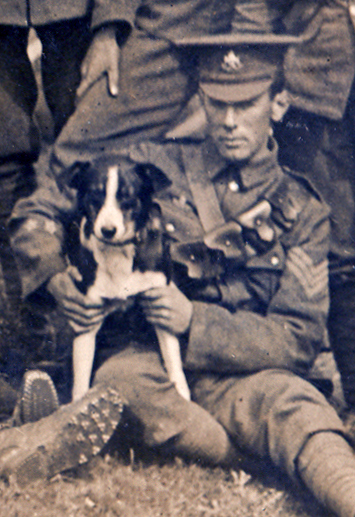 He was promoted to Lance Corporal in 1909 and to Sergeant in 1910. He attended the Annual Camps at Scarborough (in 1908, 1909 and 1911), Hindlow (1910), Aberystwyth (1912), Thornsby Park (1913) and Hummanby (1914). At the outbreak of the War Charles was working as a Colliery Shunter and was living at 81 Priory Road in Gelding. Charles arrived in France on the 25th June 1915 with the 1st Reinforcement to the 1/8th Battalion, but returned to England two months later suffering from rheumatism. Following postings to the 8th Reserve Battalion in Ballyvonare Camp at Buttevant in County Cork, he was finally discharged on the 3rd September 1916 and received a pension for 12 months. Subsequent medical boards in 1917 and 1918 failed to grant him an extension to his army pension. 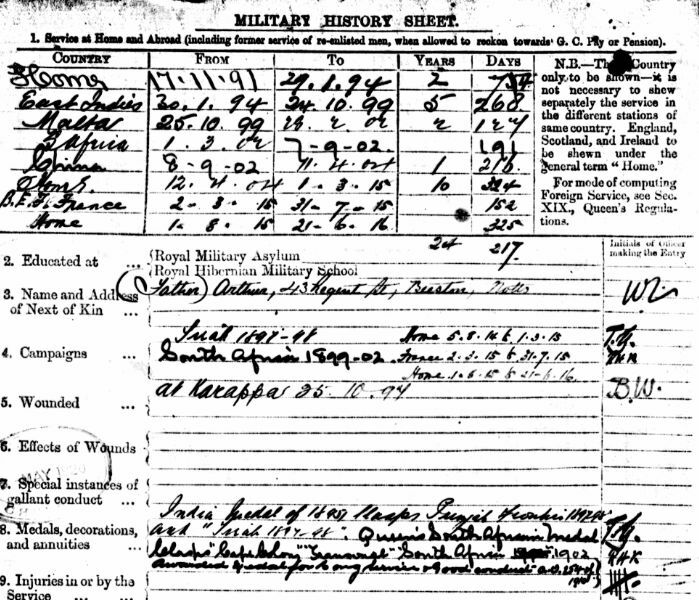 Army Service Record of Charles Rhymes recording his attendance at all the Annual Camps between 1908 and 1914 (WO363). A postcard sent from Charles Rhymes to his wife Eliza. 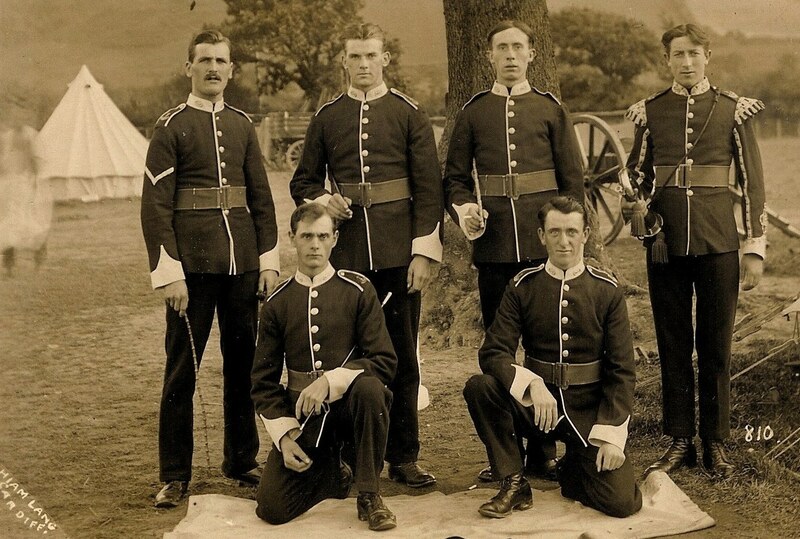 Posted in Llanfarian on Friday August 16th we learn that the 8th Battalion were leaving on Sunday 18th August at 11.45am and were due to arrive at Carlton Railway Station between 8 and 9pm. This is one of the series produced by HP Hansen of Ashbourne. In the two photographs above we see Charles Rhymes and other N.C.O.s of “E” Company taken at various Territorial Camps taken between 1909 and 1913. 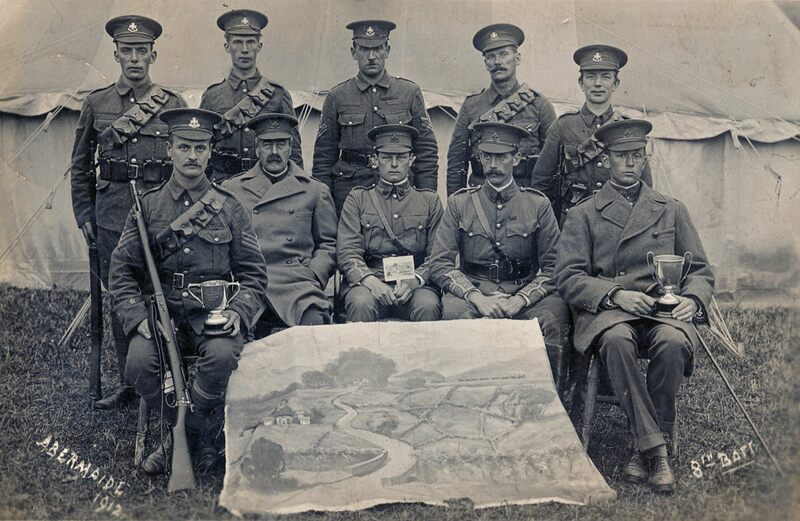 In the right hand photograph the men are wearing new leather bandolier equipment, which had been issued to the battalion whilst they were in Divisional camp at Hindlow in 1910. In the photograph standing on the far right is Edward Arthur Westerman a veteran of the Tirah and Boer War and later R.S.M. (the 8th Battalion). 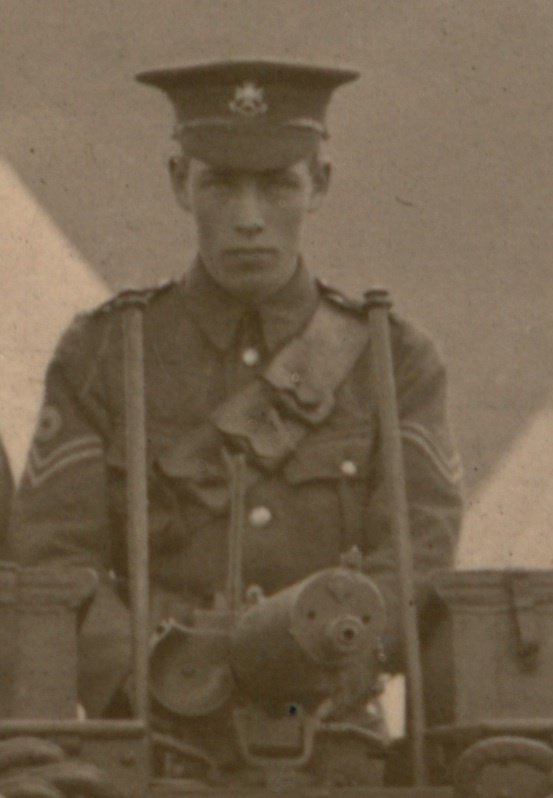 He was later Commissioned into the 6th Battalion ( 2/Lt 22.6.1916 & Lt 22.12.1917). Edward was born in 1873 and enlisted into the 4th Nottinghamshire Militia as Private 1479 in October 1891 and was then living in Regents Street in Beeston. He served as a Lance Corproal with “D” Company the 2nd Battalion in the Tirah Campaign of 1897-98. He was severely wounded by a gunshot received at Khorappa in India on the 25th October 1897. He was promoted Corporal on the 19th May 1900 and awarded Long Service & Good Condcuct Medal on 1st July 1910. He lived 31 Scott St. in Derby and died 1951 (Information courtesy of Mel Siddons). Francis George Cursham was born on 6th February 1889 and was educated at Repton College. 2/Lt 8th Battalion The Sherwood Foresters 26th April 1909, Lieutenant 14th March 1910, Captain with the 2/8th Battalion 4th August 1914, Major 1st June 1916. During the Irish Rebellion of 1916 he was wounded by rifle fire when attacking the rebels holding Clan William House on Mount Street Bridge, Dublin. He served with the Regiment during the Great War and died of wounds in an accident at Aldershot on the 31st August 1918, and is buried in Holme Pierrepont Churchyard near Nottingham. Photographs of the 8th Battalion Notts and Derby showing men of the transport section (top) and the Bugle Band (bottom). Both are from the HP Hansen series of 1912 (#1820 & #1828) and show the men busy in Camp performing their specialist roles. 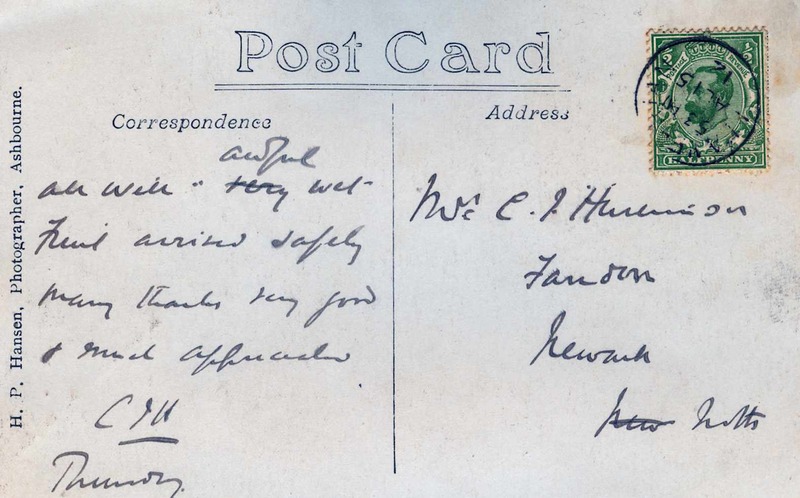 A post card sent from Major Charles John Huskinson (CJH) to his wife Annie informing her that he had arrived safely and that the weather is ‘awfully wet’. A H. P. Hansen card (#1855) showing a drum head church parade. An accompanying card (#1853) shows a different angle. 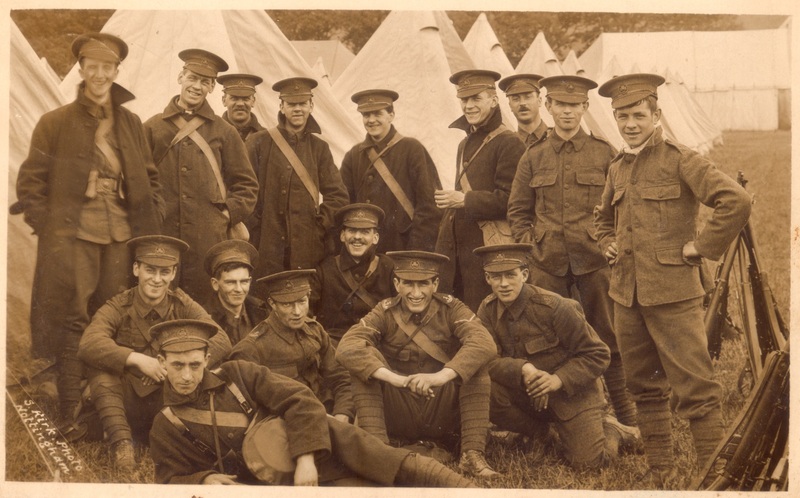 Group of 6th Battalion men (unknown publisher). 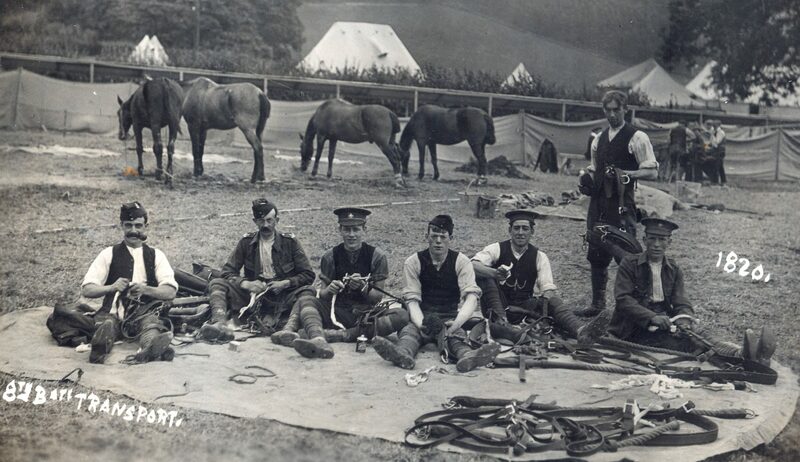 The background clearly places the men at the Abermaide campsite in 1912 but there are several inconsistencies. The man at bottom right is wearing both a standard 3-tier “Notts-and-Derby” and a 5-tier “T-6-Notts-and-Derby” shoulder titles. 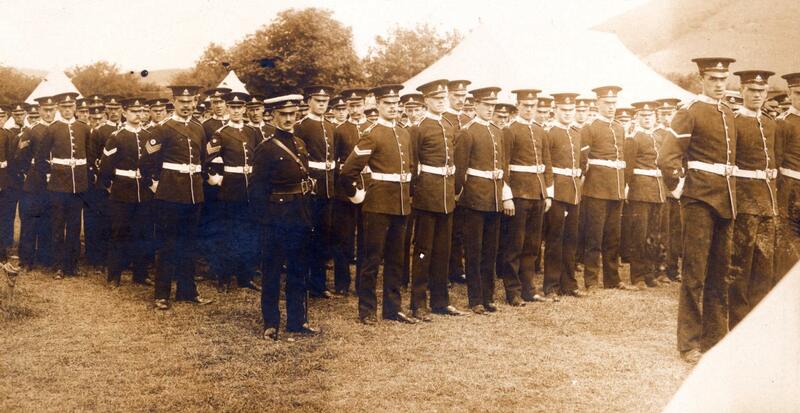 In addition the man standing in the middle is not even wearing a cap badge. 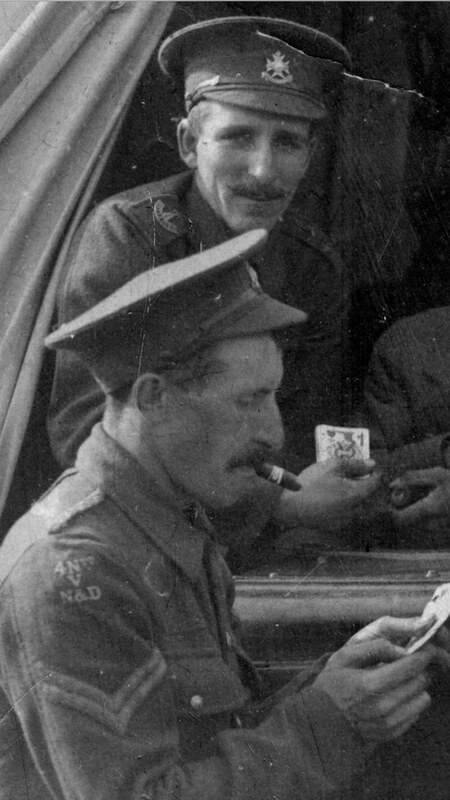 These two findings might suggest that these men have recently enlisted in the 6th Battalion and that equipment was in short supply, indeed it is known that approximately 250 men enlisted between January and December 1912. Group of 5th Battalion men (unknown publisher). 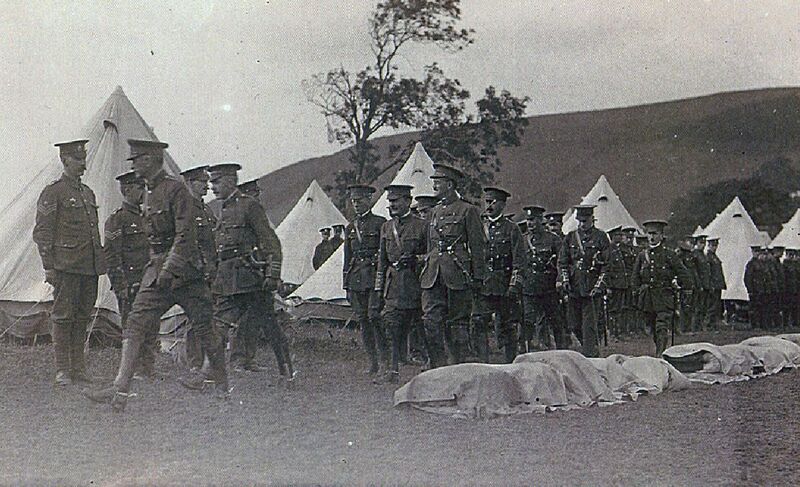 The men are in Tunic Order and two soldiers are believed to be wearing “SB” badges denoting them as Stretcher Bearers. The Officer is John Henry Frederick Marsden. 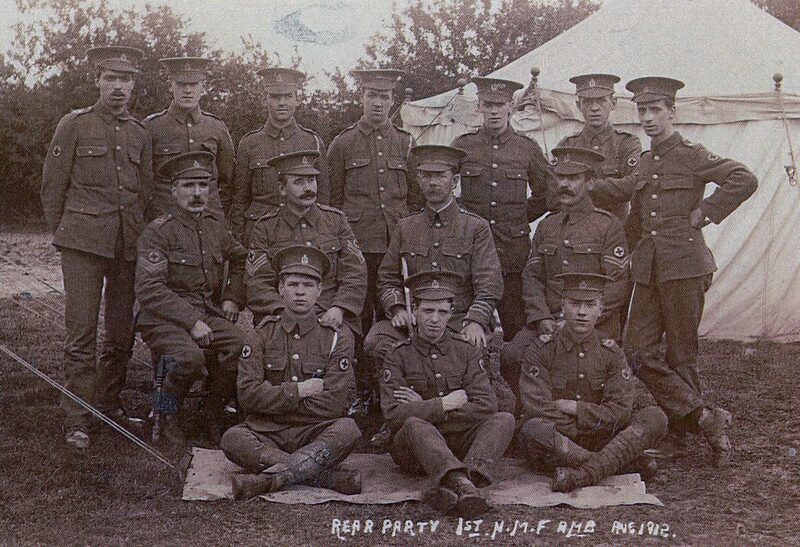 Rear Party of the 1st North Midland Field Ambulance (unknown publisher). 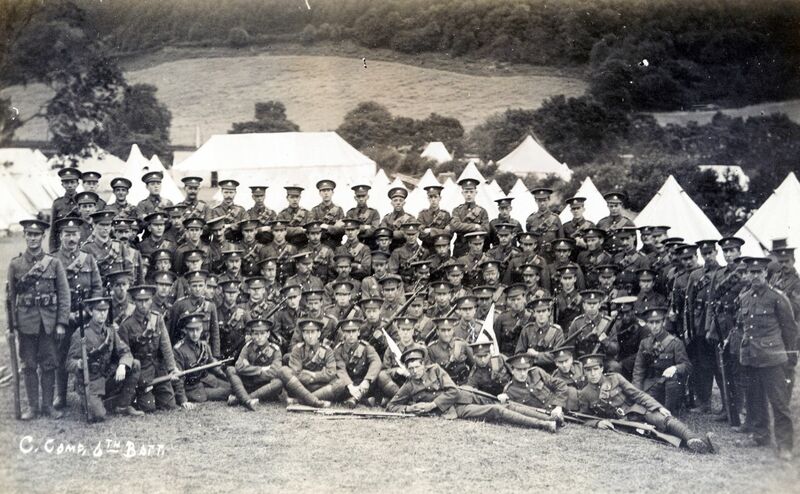 The men of the 1st NM Field Ambulance were camped with the Sherwood Foresters Brigade on the banks of the River Ystwyth. 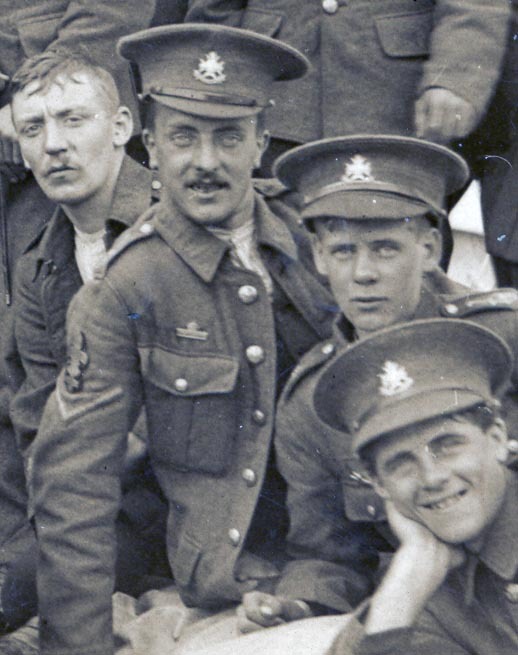 Another Hiam Lang photograph showing men from the 5th or 6th Battalion Battalion, the Leicestershire Regiment. The man kneeling on the left is Benjamin William Sturgess who was born 1889 in Long Eaton, Derbyshire but spent most of his life (before his marriage in 1919) in Mountsorrel, Leicestershire. Photograph courtesy of Annice Hanson – Benjamin’s grand daughter. Colour-Sergeant W Baker of “D” Company was 16th in Queen Mary’s. 5169 Sergt-Inst L Turner returned to 2nd Battn. 9153 Sergeant J Hardy posted from 2nd Battn. Sergeant W Knight posted from 2nd Battn. Lieut.-Colonel GM Jackson retired on the completion of his extended term in command. Lieut.-Colonel GM Jackson took the Battalion over from Colonel Herbert Brooke-Taylor in May 1904. Major John Morton Clayton was promoted to Lieut.-Colonel. John Morton Clayton was born on 17th November 1857 in Chesterfield and was gazetted 2nd Lieutenant in the 2VB on 4th April 1891; promoted to Lieutenant on 4th February 1893, Captain on 10th June 1896 and Major on 11th June 1904. For eight years he commanded A Company at Chesterfield. He was Major of Chesterfield on several occasions and a Magistrate. He played cricket twice for Derbyshire but had only modest success. He died on 1st April 1938 in West Southbourne, Hampshire aged 80. 26 Officers and 723 other ranks had accepted liability for Imperial Service abroad. In addition to the establishment, the Battalion also had 1 Adjutant, 8 Sergeant-Instructors, 2 Medical Officers, 2 Chaplains and 2 Officers and 29 other ranks of the Territorial Force Reserve. During this time the Battalion issued numbers from 1522 to 1772; 250 men in total, which represents a quarter of the entire strength of the Battalion. The reason for this large number of new recruits might lie in the fact that many of the men that enlisted in 1908 did so for 3 years and therefore became “time expired” in April 1912. Amongst the men that enlisted were John Gray and his friend Harold White who were attested into Captain Blackwell’s “D” Company at Stoney Middleton on the 21st March by Lieutenant HC Brooke Taylor. John and Harold were both 17 years old and were shoemaker riveters by trade, with John working for Mason Brothers and Harold at Cockers (WO363). 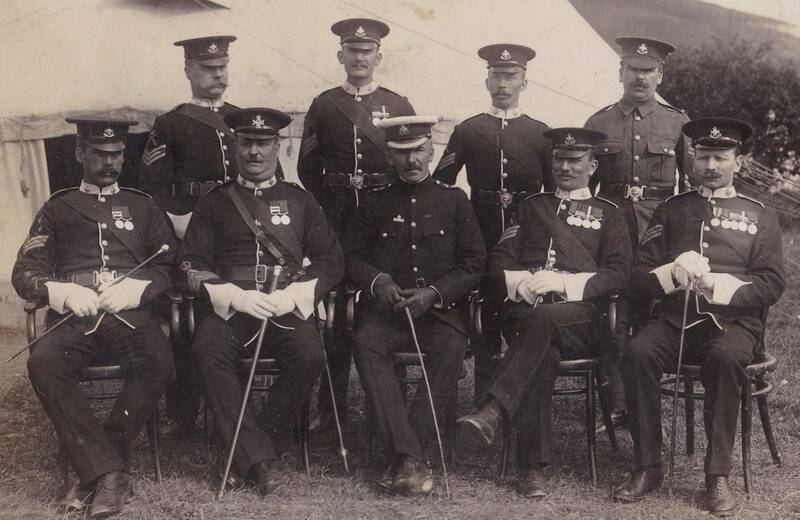 The officer sitting next to Lewis is John Henry Frederick Marsden, served in South Africa war of 1901. Was with the 1/5th Battalion, Wounded at Little Kemmel, on the 3rd June 1915 and was present at the Hohenzollern Redoubt on 14th October 1915. He was promoted to Lt/Col Commanding 45th Divisional Training School 1917-18. Commandant of the 46th Divisional Reception Camp 1919. In charge of Labour and Camps cleaning up Mons Area in February 1919 to August 1919 and was discharged in October 1919. Mel. On the post card of Rhymes (kneeling next to the officer), standing on the right is Edward Arthur Westerman a veteran of the Tirah and Boer War later RSM (8th Btn) and later commissioned into I believe the 6th Battalion ( 2/Lt 22.6.1916, Lt 22.12.1917). He was born in 1873 and enlisted into the 4th Notts Militia as Private 1479 in October 1891 then living in Regents Street, Beeston, Nottingham. Served with 2nd Battalion in the Tirah Campaign of 1897-98, 3400. L/Cpl. Served with “D” company. He was severely wounded by gunshot received at Khorappa in India on the 25th October 1897, Promoted Corporal on the 19th May 1900. He was awarded LS&GC on 1st July 1910. Lived 31 Scott St, Derby. Died 1951. If you need a picture let me know. Mike, hope you don’t mind me inserting these replies as some of the faces in your images are known to me, if you prefer I can email you in the future. Kind regards. Mel, I’m really very happy that you are commenting on these photos and can provide names to some of these faces. The more the better! Using this ‘comment function’ is a good way to do it because it keeps an online record (that’s the scientist in me! ), thanks again Mike. In the picture unknown 2/Lt sitting middle row is Francis George Cursham who was born 6th February 1889 and was educated at Repton College. 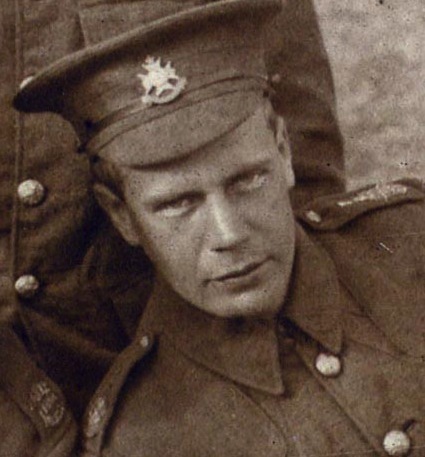 2/Lt 8th Battalion The Sherwood Foresters 26th April 1909, Lieutenant 14th March 1910, Captain with the 2/8th Battalion 4th August 1914, Major 1st June 1916. During the Irish Rebellion of 1916 he was wounded by rifle fire when attacking the rebels holding Clan William House on Mount Street Bridge, Dublin. He served with the Regiment during the Great War and died of wounds in an accident at Aldershot on the 31st August 1918, he is buried in Holme Pierrepont Churchyard near Nottingham. 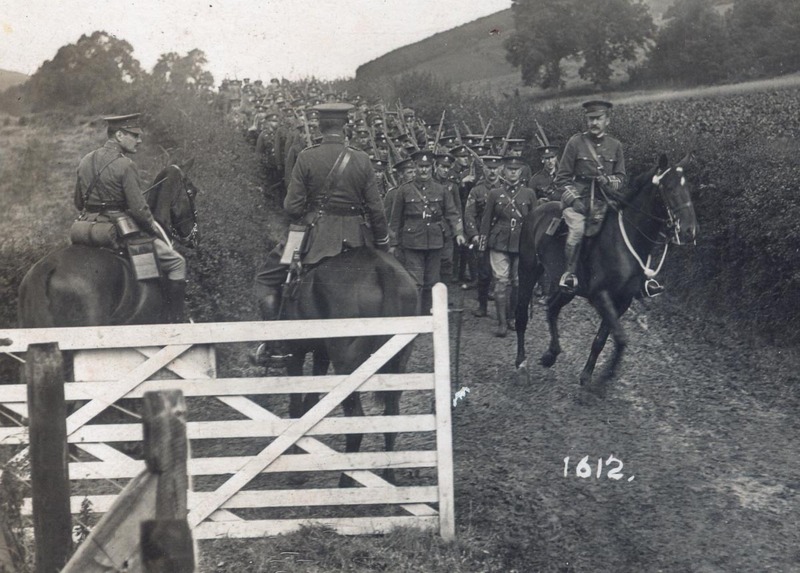 Also with regards to the picture of Colonel Foljambe leading the men out of camp on horseback, I am pretty sure the other officer is Major Thomas William Huskinson and not Charles John Huskinson they are brothers and look very similar. They came from a very well to do family in Epperstone living at the Manor House and both served at the same time with the 4th Notts VB (later 8th Btn). 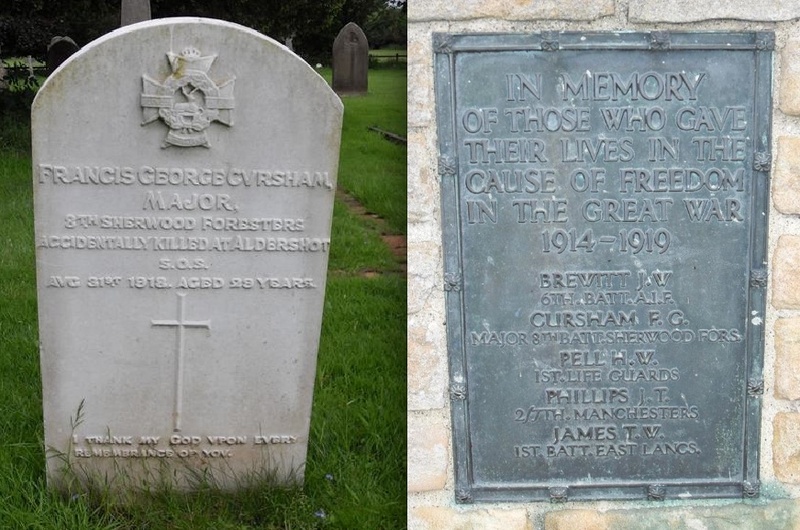 Yes, as far as I know Francis George is the son of Henry Alfred Cursham who served with the Robin Hood Rifles circa 1885, also father of Captain Curzon Cursham who also served with the 2/8th Battalion. So two brothers being present in Dublin during the rising in 1916, more info if you need it. Mel. St Edmunds Church Holme Pierrepont (where Major Cursham is buried) asked me to help to find relatives of the names on the 1st World War Memorial on the Lych Gate at the Church in order to invite them to the Remembrance Service in November. The memorial is unusual as the names on one plate are those who did not return and those on the other side of the gate are those who did return. There are 20 names from eleven families on the memorial and to date we have been able to contact a number of families, but there are still eight names from 5 families for whom we would like to find relatives. With the research has come a lot of information, so at the Service we will putting on a display of short biographies for each name. 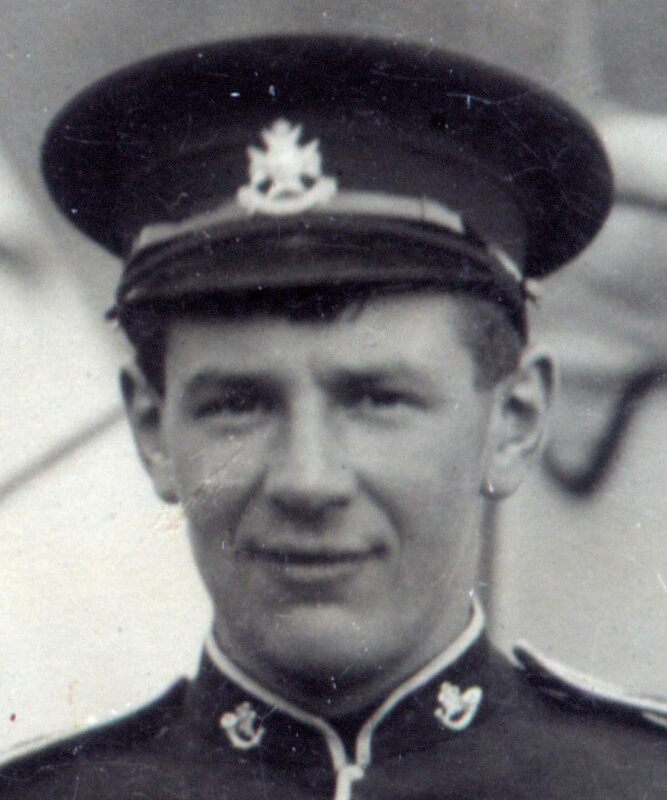 Last night I was writing up Major Cursham and with great interest came across your website outlining his military career. Major Cursham’s father Henry Alfred did indeed play football for the national side 8 times and holds the record for scoring the most goals in the FA Cup by playing for Notts County in the period 1877 – 1887 when he scored 49. Also I have a press cutting of the funeral of Major Cursham. Curzon Cursham’s name is on the memorial as a returning soldier, but I know very little about his military service apart from serving in the 8th Sherwoods and reached the rank of Lieutenant as inscribed on the memorial. Others names on the memorial that served with the Sherwoods are Private Joseph Rodgers Brewitt service number 1683 and 305222 1/8 Sherwood Foresters and 2nd Lieutenant Joseph William Pell of the 12th Sherwoods. I do have information about their families and domestic life but do you have any military information about any of these people that you could share with me? I have also just discovered that the Cursham brother’s sister Frances married Lieu R.S. Challands in 1912, but his name does not appear on the memorial. According to the 1918 absent voters list for Holme Pierrepont he served with No 6 Co 5th (R) Bn Grenadier Guards. I do not wish to hurry you but I have to have all the biogs of the soldiers named on the Holme Pierrepont War memorial completed by this Sunday at the latest in order to prepare for the small exhibition we are putting on for the Service at St Edmunds, so any information would be greatly appreciated. A question about Joseph Rodgers Brewitt of the 8th Sherwoods. I have done a search of his name on Google which brings me to your website, but as I cannot find him can you please direct to the page? I have received it thank you very much and I now need to ‘decipher’ them and use the information for the biogs. A relative of Curzon Cursham is attending the Remembrance Service and has sent us a brief biog of the brothers lives before and after the war. Thank you once again for your help. Albeit only 100 years ago it has been extremely difficult – but interesting and challenging – researching the lives of these men when all we had to start with were the names on the war memorial.